This device is designed to cut fresh or fixed tissue for metabolic experiments. It is especially advantageous for slicing small or irregular shaped specimens as one might obtain from biopsies. 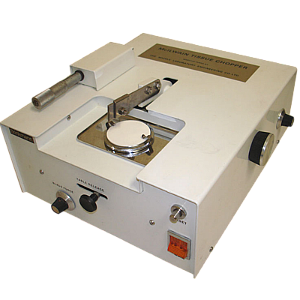 The McIlwain Tissue Chopper causes much less disturbance of the cell structure than homogenizers or blenders and has been used on various tissues of the central nervous system as well as for liver and kidney. Slices up to 1mm thickness and cubes or prisms up to 1mm cross section can be prepared with the chopper in 30 seconds. Stepless variation of slice thickness from zero to the maximum is done by means of an indexing clutch in conjunction with a micrometer head calibrated in microns. The specimen is placed on the circular, white plastic disc on the stainless steel table and is transversed automatically from left to right at an adjustable speed. At the same time, the blade is raised and dropped at speeds varying from zero to over 200 strokes per minute. The process may be repeated with the table turned 45° if prisms are desired. Turn the table 90° on the second cut for cubes. Supplied with cutting table, clips, plastic disc and blade clamp wrench. The McIlwain Tissue Chopper is also available with a petri dish cutting table. Please note that the blade holder and cutting table are modified to accommodate Ø60 x 13.7mm H petri dishes. The standard McIlwain Tissue Chopper can also be converted for petri dishes by replacing the standard blade holder and cutting table with the modified ones. Safety Warning: This instrument does not have a blade guard. Care must be exercised when using this equipment. Keep hands clear of the blade and table when cuttting sections. Remove blade when instrument is not in use. Cutting speed adjustable, 0 to over 200 strokes/min.